Provide your drone continuous power for steady and well-balanced flying. Tips:When the cable is connected to the charger, but no battery connected, led Lights on. Please make sure that the size of the battery is suitable for your drone before purchasing! On receving, please double check whether battery swelled up.If swelled up, do stop using or charging, and contact us in time. Do not overcharge or over-discharge the batteries. Capacity:3.7V 860mAh rc drone battery, guarantee more flight time. Product size:60mm*28mm*8mm / 2.36 x 1.1x 0. 31 inch Weight: 24g / 0. 84oz(not including wires and package). 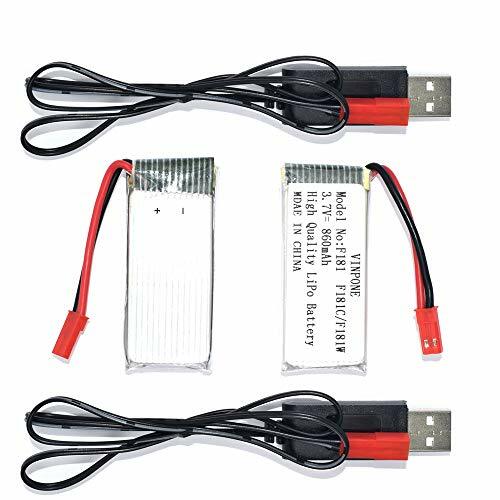 Package including: 2pcs 3.7V 860mAh Lipo Battery, 2pcs USB cables. If you have any questions about this product by VinPone, contact us by completing and submitting the form below. If you are looking for a specif part number, please include it with your message.